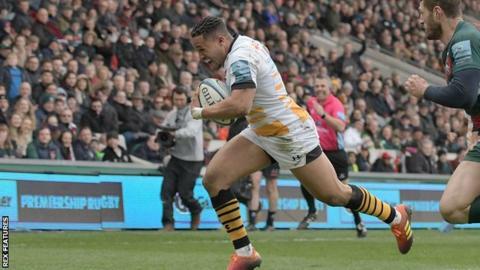 Wasps wing Marcus Watson and back-row forward Ben Morris have signed new contracts with the Premiership club. Watson, 27, who is the brother of England and Bath full-back Anthony, has scored 11 tries in 24 appearances since joining from Newcastle in 2017. He won an Olympic silver medal with Team GB in rugby sevens at Rio 2016, before returning to the 15-a-side game. "Now it's about trying to stay injury-free and show what I can do to help the club climb the table," said Watson. Morris, 27, who can also play in the second row, becomes the 12th first-team player this season to commit his future to the club. He said: "It's been great to get a taste of Premiership and Champions Cup rugby this season and now it's certainly my target to play more." Wasps have not announced the lengths of the new deals.